“All we really have is now.” So says Brix Smith Start. All we really have is our words, thoughts and feelings about this current moment. Words can help you through. I’ve had a rotten illness this past fortnight-and-a-bit. “It will make you feel pretty grotty,” said the doctor who diagnosed my ailment. His words were not incorrect. My ability and energy to do anything much took a distinct knock. It’s been an achingly slow and gradual process of getting back towards feeling better. Time’s progress seemed to come to a halt. A lot of sleeping. A lot of odd dreams. A lot of reading. The words you need to hear will find you at the right moment. Gentle reader: When was the last time a book truly spoke to you? It happened to me this week. 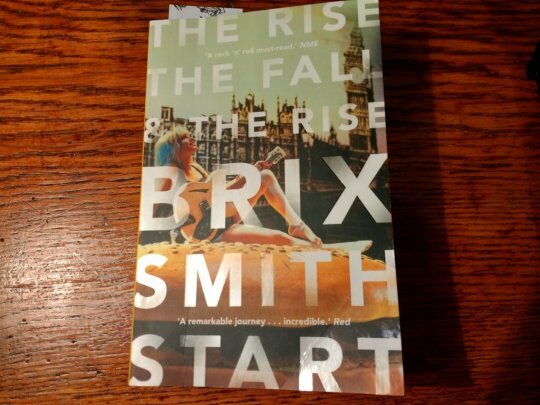 “All we really have is now.” So writes Brix Smith Start in her wonderful book The Rise, The Fall And The Rise. I’ve been completely immersed in this tome whilst recuperating. ** This book of Brix*** is vivid. Her words live and breathe. Absolutely alive with a joyful, innocent spirit. Full of love, loss and learning, this book tells the story of her remarkable path through life. Upbeat, veering at the drop of a hat in wildly impulsive yet oddly logical directions. At times, dream and life intertwine. A life and a book that match the wildly unpredictable but ultimately life-affirming twists and turns of the rollercoaster rides in her beloved Disneyland. I knew of Brix from her time in The Fall. The Fall have existed for four decades, and are still (just about) in existence today. They were John Peel’s all-time favourite band. Peel described their wonderful and frightening world perfectly: “They are always different; they are always the same.” Brix is the ex-wife of Fall singer Mark E Smith – the band’s sole founding member and for nearly all of the band’s existence, its figurehead and führer****. Brix wrote and played on some wonderful music during her time in The Fall. I reached this passage just when I was starting to wonder if this illness would ever pack its bags and leave. The simple and clear truth of these words hit home. These were the perfect words for me at that exact moment. It’s fair to say that Brix’s book spoke to me. Other books have spoken to me before, and I pray this will continue to happen for the rest of my days. But I’ve never had the author of a book actually speak to me while I was reading it. Last Sunday (26 November 2017), I tweeted that I had just revisited one of my favourite Fall tunes – the short, 60s-influenced spooky-groovy instrumental Mansion – after reading what Brix wrote about the moment that she wrote it. 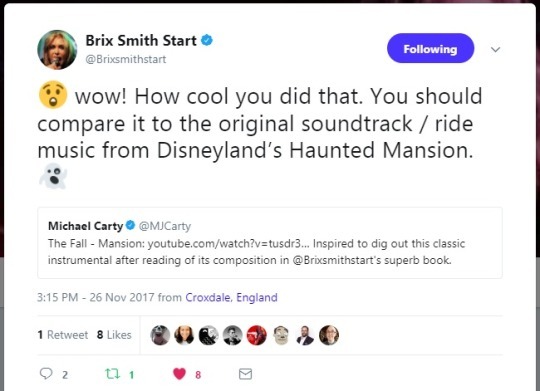 I was amazed and delighted to receive a tweet from Brix, expanding on the Disney-derived inspiration for this fantastic tune. Words and language are the most powerful gifts we have. Thank you for this wonderful tweet, for the wonderful music and this wonderful book, Mrs Smith Start. * Try it for yourself, right now. Say some sincere words to the next person you see that you know will make them feel better. ** I still am, and I absolutely don’t want this book to end. I am writing these words in part to put off reading the last few pages and thereby delay bringing to an end the journey on which it has taken me. *** Her name is short for Brixton, adopted as her new name at a key moment of transformation in her life from a Clash song that she loves). **** I use the word “führer” carefully; given some of the terrifying depths of some of Smith’s addled, malevolent behaviour depicted in the book, it seems apt. 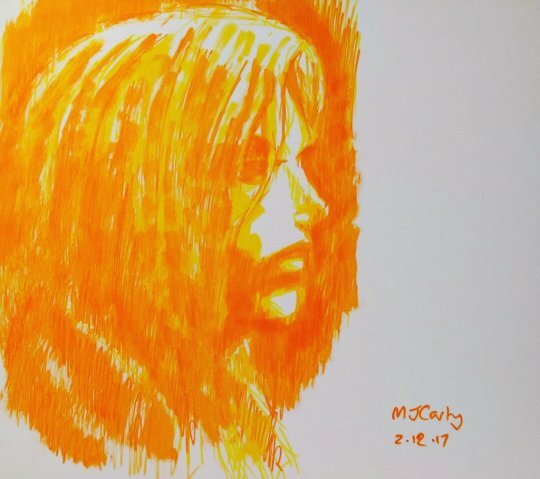 My attempt at a picture of Brix Smith Start, based on a still from a hugely enjoyable concert by her current band Brix and the Extricated, which I found on YouTube.